Have rental car with unlimited mileage, will drive it! We hopped on route 2 and swung around the southern part of PR. Toni's Uncle Charlie told me these blocks house the caskets rather than burying them directly touching the soil. - wonder if it's because it's so humid/wet here? If you look closely you can see PONCE spelled in reverse in giant letters. It greeted us as we left Ponce on the highway. 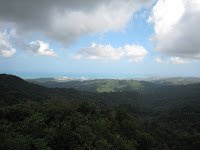 We continued up to San Juan and east towards El Yunque. Almost 4 hours in the getting there. Four hours of reminiscing and beautiful scenery. Veronica slept for much of it in the back seat. She told me later that watching her Mom and I from the back seat, we looked to her like two middle school girls with all of our chatting and giggling. 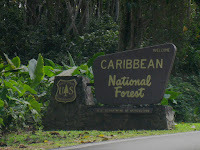 As we drove into the Caribbean National Forest, the car was filled with excitement. We first visited the El Portal visitors/information center. Boy did they put a LOT of work into this place! It has a beautiful gift shop too!! Many books on plants, some fun (not cheapo) stuffed animals and a number of fun children's books in both English and Spanish. Turn right onto route #191 and voila -- you're in the forest!! 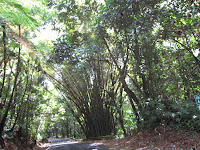 I couldn't help taking a photo of this clump of bamboo -- it was so pretty!! The photograph would be better, but I'm driving and the road is SUPER winding! You have to be on constant alert in case a car is coming the other way. Especially the TOUR BUSES! They could (and I'm sure have) run someone off the road into the ditch. After our long mornings journey, we were ready for some lunch!!! Thankfully there was a small luncheon spot serving PR treats along with snacks. We got some pork chops and a chicken pincho (grilled meat skewer). Most importantly, we got two Papa de Relleno (see right)! 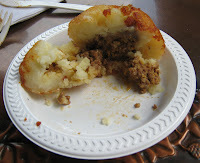 Softball sized balls of mashed potato that are stuffed with spiced meat and then fried. So so tasty! Yum! Refreshed and ready to walk off the fried food, we parked the car and hiked in the half mile to see La Mina. The trail was unlike any I'd ever seen... It was completely cemented (shown left) into place with stones places in the cement for traction. The ENTIRE length of the trail is like this. 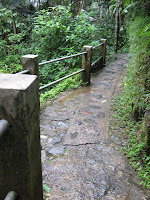 It made us wonder who lugged in the cement etc to make this trail. WOW! I'm sure it hold up better in the heavy rain storms -- no erosion. They also built beautiful picnic huts (shown at right) complete with water faucet and barbecue stands. Looked like the perfect San Juan weekend picnic get away! La Mina is the most commonly photographed waterfall in the forest. If you've seen a photo of a waterfall from this forest, it's likely this one! (It's the one that Miss America shot photos of the candidates at the base of a few years ago.) 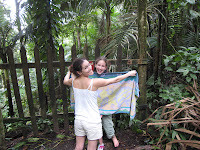 After reaching La Mina and dipping a finger in to test the temperature of the water, we decided to change into our bathing suits...behind a towel. The water was... cold compared to the temperature of the ocean we'd been swimming in, but not as cold as the rivers in New Hampshire in June/July. Toni was the most brave going completely under. I wimped out on the total dunk when my toes started cramping up. Figured it wouldn't be good if I couldn't drive the 4 hours back home. It was a refreshing dip though!! 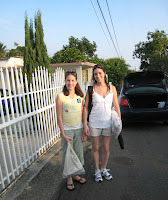 When we reached the car it was time to start heading back to Rincon. Toni's Mom had arrived and she (and we) were looking forward to seeing her. I hadn't seen her in YEARS!!! It was a long and winding road home. We chose to take the "more direct" route (according to the map) home. This brought us through San Juan and into the usual traffic that comes from this city. It took nearly as long to get back as it did to get to the forest in the first place. We had a great ride back too. Halfway home Toni received a call from her brother to wish her good luck the next day. In the end he couldn't hold the surprise and told her that he was in Puerto Rico and would be awaiting her arrival home. 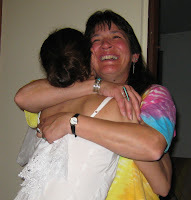 This sent her into tears of happiness! Yeah to Uncle Charlie for flying him in! Upon arrival back at Grandma's house, we had a bite... Alan (Toni's Dad) had made some AWESOME chili, and Toni gave her Mom the hankie she'd had embroidered with a lovely message for her Mom to bring to the wedding. She was definitely touched! Boy was this a LONG but fun day with Toni and Veronica!!! Bed calls my name -- the wedding is tomorrow!!! By the way - The photos above from the forest are quite large -- if you right click and "open in new window" you can load them in larger if you want to see detail. There were just too many of them to load in so large! Cheers! 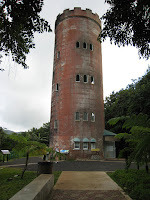 El Yunque here we come! We're going to take route 2 down from Rincón, which is not only said to be beautifully scenic, but a route Toni's never been on in all the near yearly visits. 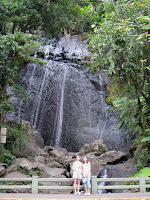 After route 2 we'll journey up route 1 and creep into the Caribbean National Forest known as El Yunque. It should be a 3 to 3.5 hour drive there so we're off for an early start! Can't wait! My first tropical rain forest! I've got the new camera ready to go! Yippee! This is going to be a fun day!! I spent a portion of the trip frogging the one skein wonder I'd almost finished with the bamboo yarn. (I need all 10 skeins for the sweater I'm going to make!) A little girl watched with great interest as I ripped it all out and wound it up. I can just picture her unraveling a sweater of her own while her Mom find her mid-frogging. 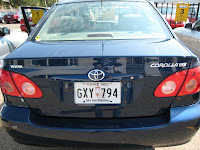 Upon landing -- I picked up my 4-door Toyota and was OFF! I flew into Aguadilla, the airport on the northwest coast of Puerto Rico. If you are flying to PR to surf or hang out in Rincon, I can't reccomend this airport enough -- it's over 2 and a half hours closer to Rincon than the San Juan airport. As I wound through the back roads on the directions list, I happened upon a Volkswagen rally. Sadly by the time the traffic lifted I only had time to take this one shot... there were some amazingly tricked out cars and some wonderful airbrushed scenes like this one of the Mystery Machine I just really wanted to get to the Red Parrot Inn and settle in. After lounging by the pool (that's the bride, Toni, as beautiful as ever) with everyone, having a snack and swimming in the ocean, Toni and her daughter and I drove over to her grandmother's house back near the center of Rincon. Toni's grandmother is WONDERFUL! We hit it off right away. She tried to convince me that I was her long lost twin. 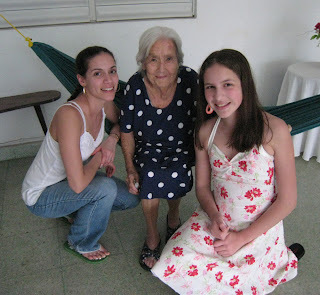 Quite a feit since she's 95! Her house is very special, with 3 bedrooms in the main house plus the cottage out back and the extra room under the house. You can sleep at least 10 in that house! 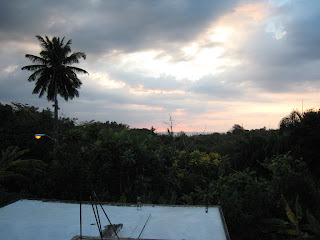 I loved the view from the roof -- I was able to catch the sunset (shown below). Beautiful! It was a lovely first day finished with a tasty meal back at the Lazy Parrot's restaurant, Smilin' Joe's. Really tasty goat cheese salad (with dried cranberries and almonds!) Yum! Time for an early turn in! More fun tomorrow! Who takes the 5:45am flight in Sunday? That Guy...he figured it was a Saturday night and he would just drink until 3am and then head the the airport. Everyone is praying they aren't sitting next to him as he reeeeeks of stale beer. He's also the one likely to get air sick. The Retired Island Hoppers...they've been to 4 islands so far this year and the 5:45am flight allows them to be on the beach by noon as not to loose that tan. The Home Going Fellow... He arrives at the airport in flip flops, shorts and a tanktop...yes it's 24F here in New York. Makes me wonder if he lives in PR and is going home, or if he's visiting? The Vacationing Family...5 kids (ranging in age from infant to 12) and 2 adults... The kids are near comatose...don't worry, they'll wake up on the flight when you're trying to sleep. And Me - Toni & Pete's wedding here I come!! I didn't bring my laptop, but it looks like I can post from my Blackberry and add photos later! Oooh - Dunkin' Donuts is OPEN! Further showing why I love them! Does it get any better than this (at 4:30am on a Sunday)? Yesterday I got my travel shots...something that I haven't needed to do since I went to the USSR in high school. I can talk to a crowd of thousands, run a company, jump in and run with whatever is needed...but the sight of a needle for shots... I'm all whooosey! Silly? Yes. Then begins the inner dialog...the fight between logic and emotion. Yes, I'm a wuss...but I'm not a fool! Although Typhoid isn't so easy to get, I don't want to have to avoid street foods in Sri Lanka because I didn't get a shot. Yippee, these combined with the Malaria pills and I'm ready to go! 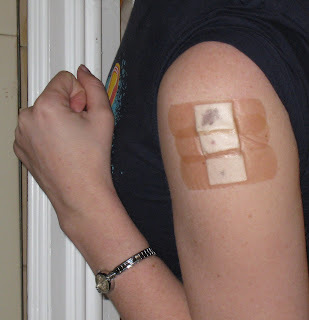 Beware that your arm is left "heavy" that first day and you awake with a quite painful shoulder the next day (there is one direction that it's still near impossible to move it in), but this will pass. Now to finish packing for Puerto Rico! It's been harder than you might think...I've now lost 18/19lbs...and I haven't been this size in warm weather in...4+ years!! So I've been digging out the boxes of my favorite things that I've stored in my downstairs closet for years. I ALMOST donated them all this last summer! Thankfully I didn't! It's like shopping! Weeeeeeeeeeee! Reminds me of when I was a child and I'd grow to the next size. Mom would send me to "the big closet", a super deep closet whose floor housed bags of clothing organized by size that she'd purchased at yard sales or the local thrift store, often on bag day. Are there any thrift stores out there that still have a bag day, where you pay a set price and you fill the bag to the tippety top? It sure was a wonderful way for my Mom to dress my brother and I at a reasonable price!!! OK - back to errands...15 hours until I leave for the airport for Puerto Rico!! I still haven't selected my beach knitting project!!! Gotta go!! Just as Unravelling has a lofty goal of 100 miles of knitting and walking by April 1st, I have a lofty goal of umpteen pages of reading in 4 travel books...which has cut way into my knitting time!! 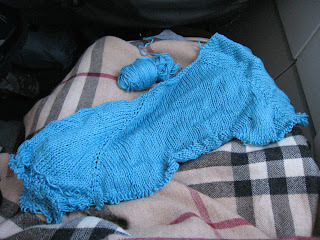 OK, so it's not QUITE the same thing -- but you should definately check out Celia's knitting/walking journey! The planning itself isn't the problem... it's doing the planning while bouncing from NY to Seattle to China to NY to Puerto Rico to NY -- phew! Oh yah...all while working full time. "Yes, today I'm honored to accept the master certification in multi-tasking. Thank you..."
I guess I'll start at... the start... I'll be making 4 new stops in four new cities/countries in the next... less than 2 months! That doesn't include the stops in Hong Kong, 2 stops in China, and Florence, Italy... all for work. 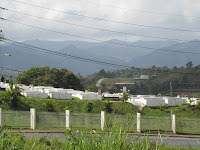 Sunday, VERY early, I'll fly to Aguadilla, Puerto Rico to start my week away! 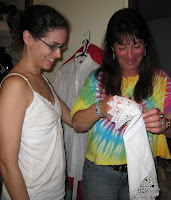 I'll proudly walk down the isle and represent my dear friend Toni as her maid-of-honor while there. I'll take a ton of photos - yeah new camera!! Have rental car, will drive! 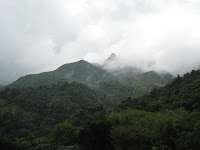 I want to hike in the tropical rainforests: El Yunque and Guanica State Forest, visit the Rio Camuy Caves, swim with the dinoflagellates in Mosquito Bay on Vieques and perhaps even learn to surf in Rincon!! Yes, I've been reading the travel guide. I didn't realize the lack of safety at night in PR... traveling alone I'll have to be extra careful! I do wish Dan could have come...but it's quite a commute from South Africa. Yesterday I booked the hotel rooms for the start of the BIG trip (starting March 9th)...which begins in Mumbai (otherwise known as Bombay.) This first stop is for work, but I'm hoping to get in a bit of play time! Dan will arrive in India a day before my boss and I arrive. This will be the first time I see him since I last saw him in Seattle. Since we last saw each other I will have been to China and Puerto Rico, and he will have completed his month-long volunteer journey through South Africa and some of their botanical gardens. Yeah!! I've been reading the two Mumbai guides trying to sort out my evening fun and what I could squeeze into that one free day!! From there I'm taking a few days off (shocking, I know) and we're traveling onwards to Sri Lanka! I've been reading the The Rough Guide to Sri Lanka too! I have to book the hotel for our first night, in Negombo, today. Thankfully Dan's taking care of the rest of the days where we'll call Kandy home-base. A friend of his will act as tour guide too boot! I'm really looking forward to it! The forth guide I haven't looked at in weeks, but will do so after Sri Lanka... What guide? Paris! Yippee!! A little planning will undoubtedly go far! It's a few years old, this guide. I bought it in 2004 when I had tried to plan a trip to Paris to no avail. Michelle and I have got the housing swap organized too! Yeah!! And...our plane tickets have been secured! There are quite a number of people coming for the wedding from NYC and around Europe! It is sure to be a FUN time! Ohhhh, where has the knitting time gone!! Work really does get in the way! I am very excited. So much to see... so little time!! I'm also happy to be sharing a few of the stops with Dan and girlfriends of mine. Yeah!!! The hardest part? Packing!! How the heck am I going to pack one suitcase that will work for the tropics of India & Sri Lanka, the air conditioning of Hong Kong and China, the style and elegance of Italy and Paris -- AND the wedding in Paris. All in one suitcase! I guess it'll be the true test of packing! I guess I'll have to rely on fabulous accessories! I'm hoping to send the dress I'll wear to the wedding with Michelle so it doesn't have to visit and survive 7 cities in 5 countries first! And I may send the Paris and Italy books ahead to pick up in Hong Kong... these travel books are HEAVY!! If anyone has any "You MUST SEE" suggestions for any of these cities, please drop me a comment! Cheers! Time for work! What do you do when you are greeted as you rise by a chocolate brown cat, soaked to the bone, leaving a wet and blackened ring on the ivory couch? In this case it was some filth that was leaching up INTO my downstairs bathtub that houses the litterbox. What? Er? I'm also trying to picture my sweet Coco falling in...he's the only cat I've ever had that has horrible balance! To the plumber! Well...after waiting for much of the day the plumber came to me! Thankfully he was able to fix it! See...this is a reason that I'm not so upset to be renting rather than owning. One little call to the property management office and voila! After that had passed, and I'd put in my days work from home, I walked to the post office to collect the mail I'd had held while I'd been in Seattle and Asia. Apparently, although you can only hold mail for 30 days online, you can ask your mail carrier to extend this! I'll be trying it on the "big trip" in a few weeks! I'll let you know how it works. The best news of the day is the aquiring of my NEW CAMERA! Yeah!!! I figured since I'm about to embark on 4 new cities in 2 months, I'd best have a proper camera. Now in this case, by proper camera, I mean one that is small enough to fit in a cocktail glitzy handbag, but still take amazing photos and stila llow me to change the ISO etc. So, what'd I decide upon? The Cannon SD800! I'll contintue to let you know what I think of it as I learn how to best use it! CARNIVAL! Tonight was the dinner at Sushi Samba 7 to celebrate Carnival! 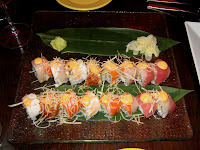 Both Sushi Samba locations in NYC are Japanese/Brazilian...and both are YUMMY! Having tried "7" tonight rather than the loacation I usually go to "Park", I find that I prefer "Park." Although I know "7" has a roof deck that's open in the warm weather. Yes, I had to play with my new camera from the moment I sat down at the bar awaiting my friends. I love the photo of the ginger and peppers. I also love the fact that the bar at Sushi Samba makes drinks using both of these fresh ingredients! There wasn't a bad choice in the group! Of course, we weren't here JUST for the great grub! We were here to see the Carnival dancers and drummers!! They started the show at around 9pm and danced for about 15 minutes. Wow can those girls shake it to that very VERY fast paced drum and whistle music! Yeowza! Emmanuel borrowed my new camera and chased after the dancers for some photos as they danced on the pther side of the restaurant. His photos looked like this one (right). See, his wife caught him in some sort of euphoria over it! Funny how all of the shots I took were from the front and all of his from the back. After I took a few shots, one of the two dancers pulled me up for a dance and Ho, a freind of Jo and Emmanuel's that joined us tonight, was nice enough to snap a shot of us. I see to slowly be meeting the vast friendship network of Jo and Emmanuel's that wil also be making the journey to Paris for the wedding! Fun! Old friends and new, we all had a fun evening!! Thanks for joining me all! Allegra - FEEL BETTER! Michelle - my thoughts are with you and your family! We missed you both tonight! Hugs all around! PS - Drop me a comment and let me know if the above "slide" show is viewable. I can view it on my laptop but it doesn't seem to load on my desk top. Trying to decide if i should continue to use it. If it doesn't work for you - you can click the "view all images" button and a window will open showing them. Cheers! Max Brenner's & Patsy's oh my! I was so very upset last spring when I went to go for my usual Max Brenner's (The Bald Man) chocolate fondue at Harrod's in London...and it was GONE!! GONE!! Harrod's had put in "Harrod's Chocolate Cafe" - blah. Not as good I tell ya. I found out soon after that Max Brenner's had FINALLY arrived in NYC! PHEW! Visiting the Bald Man and picking up a box of chocolates here should be a mandatory stop on anyone's list when visiting NYC. The chocolate fondue "for two" complete with banana, strawberries, banana bread and marshmallows. The flame was to cook the marshmallows prior to dipping. We three shared it and were sad to see so much of the yummy dark chocolate dipping sauce left over. You do have the choice of taking two different sauces (white, milk or dark), but we all didn't want to soil the flavour of the dark chocolate with another sauce. I was glad to be able to join last nights crew for dinner at Patsy's. I'd brought Jo here a few weeks ago, but this was both Rafael and Emmanuel's first times. More people means more dishes to share. Yum yum yum! The trick is not to over eat. I've gotten pretty good at stopping when I'm full! Yeah!!! Let's hope I can continue this through all of my travels ahead!! One of my little cats has suddenly taken to using my plants as a litter box (no wonder they are suddenly fighting for their lives!!) EWE! Trying to figure out how to stop them (ideas WELCOME!!) In the meantime I’ve put each pot into a trash bag and tied it up over the top. Hopefully it’ll stave it off. I’m traveling so much these next 8-10 weeks, I won’t be here to enforce anything. Help!!! After a quick phone called invite I popped on some warm clothes and met Joe, Emmanuel and their friend in from Spain, Rafael, for some ice skating at Lasker Rink in Central Park. The rink is small but well kept and you can skate (with renting skates) for $9.50. My rented skates were scarily dull, but they were happy to sharpen them upon my request. This was my second time skating this winter. Fun! It was also Rafael’s first time skating – EVER! So we took turns teaching him a little of this and a little of that, and by the time we left, he was able to make laps without holding onto the wall. Good show! From here we walked back through the park – just beautiful – I love this photo of Jo and I. Where to next? We ended up at my house for some Smiley drink and Silver Moon pastries. What’s the happy drink? On the stove, heat a slightly less filled cup of cider for each person. While the cider heats up, mix cinnamon and sugar to your liking and place on a flat bottomed plate. Moisten the rim of each mug with the lime wedge and roll the rim through the cinnamon and sugar. Being careful not to disturb the cinn-sug edge, drop a shot of Butterscotch schnapps into each mug. Once the cider is heated (no need to boil), gently ladle cider into each mug and serve! You can’t help but smile as you drink it! My three guests headed back to their homestead to prepare for the further festivities, and a few hours later I joined them for the Chinese New Year Steamboat celebration! She started with Tom Yum soup in the Steamboat and let it heat up until it was piping hot! We then added so many things!! Enoki mushrooms, bok choy, cabbage, noodles, chicken, prawns, tofu etc. etc. etc. YUM! We also enjoyed the the two cans of abalone that I brought Jo back from Hong Kon g. It’s a traditional dish in Singapore and in China for CNY. Simply open the can, slice and serve. Yum! Thanks for putting so much care into this special meal Jo!! Yum yum yum!! By the way -- your fancy scarf is coming along so well! I can't believe how well you've picked up knitting! I'd like to think it's my teaching that did it -- but I really think you're a natural!